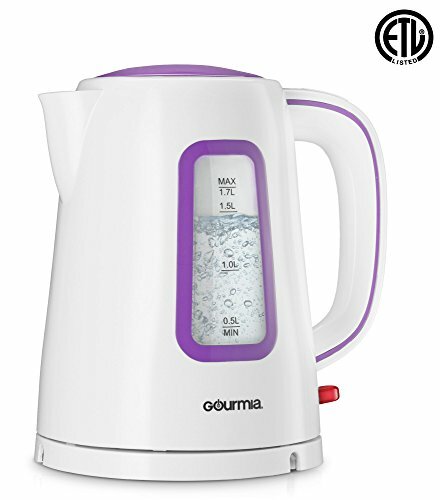 Boil water easily and efficiently with this Gourmia GK220 Electric Kettle. The magical hidden heating element eliminates the need for those rusty metal coils, and boasts 1500 watts of sheer boiling power. water. Heat up to 1.7 liters of piping hot water in a flash! Equipped with double sided external water gauge windows, so you can easily measure, and use for all of your favorite coffees, teas, and cereals. Simply fill, hit boil, and then lift the 360º rotating cordless body off the base for free carrying and pouring. to ensure completely safe kettle usage. SPEED BOIL: 1500 watts of sheer boiling power heats up your water in a fraction of the time taken by out-dated stovetop versions. AUTO EASE: Just a click, to automatically boil perfectly heated water for everything from tea, to cocoa, noodles, and cereal! CORDLESS CARRY: Designed with durable stainless steel and boast a large 1.7L capacity. Features a hidden heating element, eliminating the need for those rusty metal coils. Rotates 360° on base and detaches for free cordless carrying and pouring. SAFETY FEATURES: Boil dry protection, lid-lock, and auto shut-off ensures completely safe scorch-free usage. Integrated spout filter for only pure water pouring.